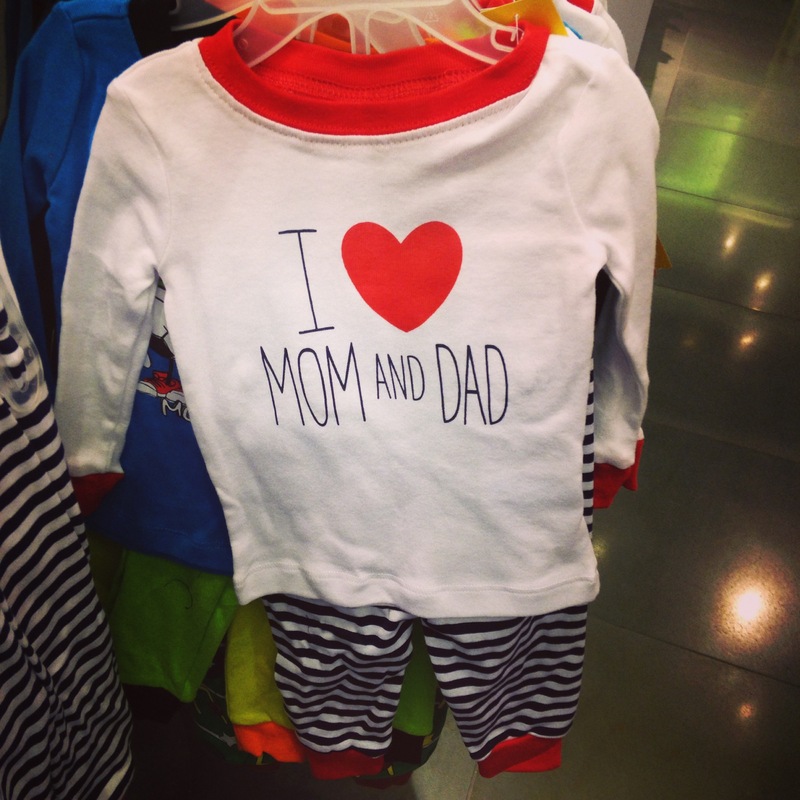 The Children’s Place is the leading kids clothes and baby clothes store in the United States. With fresh fashions, quality materials and fun designs, it’s the affordable kids clothing brand that I recommend to other parents. 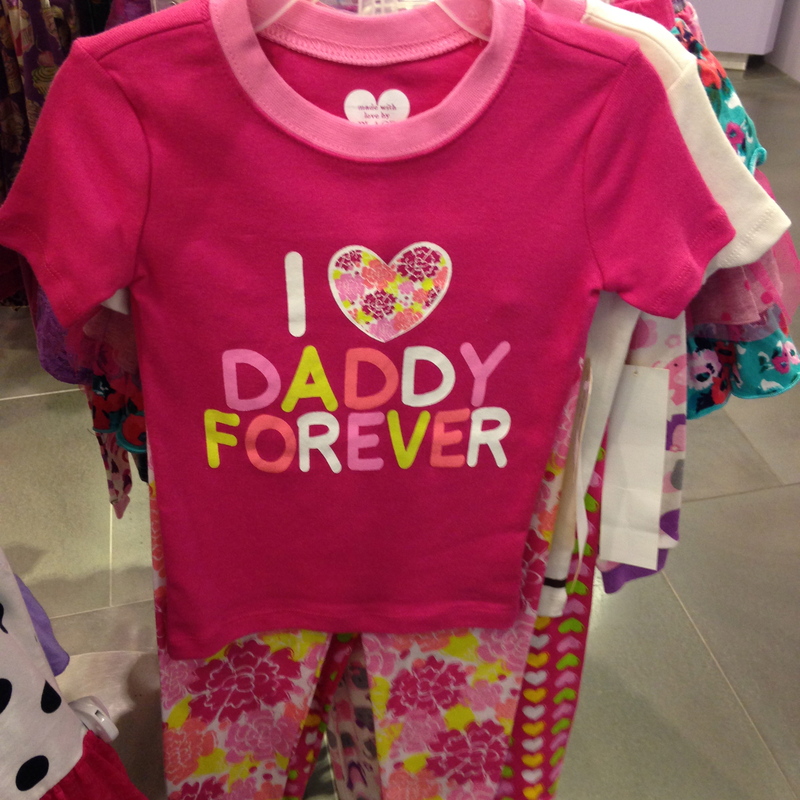 I’ve been dressing my daughter in The Children’s Place since her birth. The clothing is comfortable for her sensitive skin. She loves the colorful and creative tops, bottoms, dresses, pants and shorts. I love the quality of the clothing. I can wash them often without worrying about fading or unraveling. The wide range of baby clothing gives you a choice of looks for your newborn boy or girl. It is my go-to place for baby gifts. It’s the only place I shop for fun bedtime wear. The Children’s Place offers a selection of kids sleepwear and baby pajamas that keep children comfortable and warm in the winter when they kick off the covers and cool when they sleep in the summer. When Spring arrives, the clothing offers pastel and bright colors. 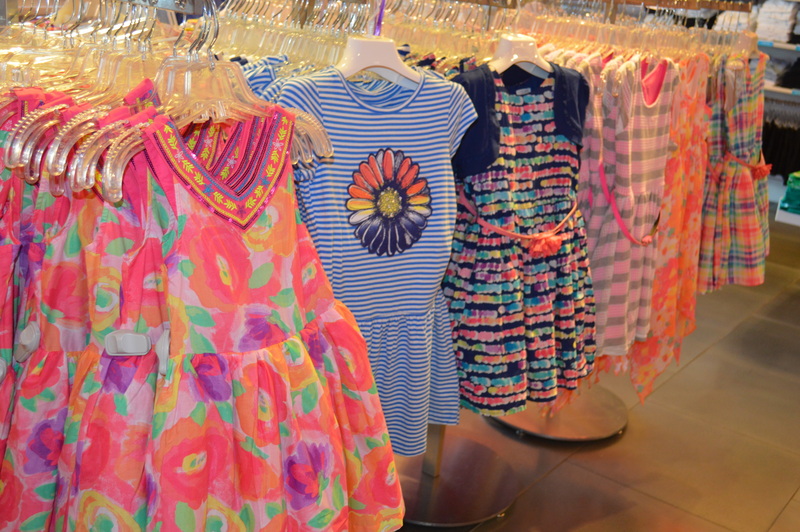 Girls dresses are festive and fun for church, brunch and Easter egg hunting. Summertime at The Children’s Place is where I find kids swimwear, including girls swimsuits and coverups, sandals and sunglasses. Boys swim trunks are solid or with a whimsical design for fun in the water. The Children’s Place partners with Disney and others to create Frozen and Disney to Star Wars and The Avengers clothing. They are officially licensed items perfect for children to believe they are a little princess or superhero. 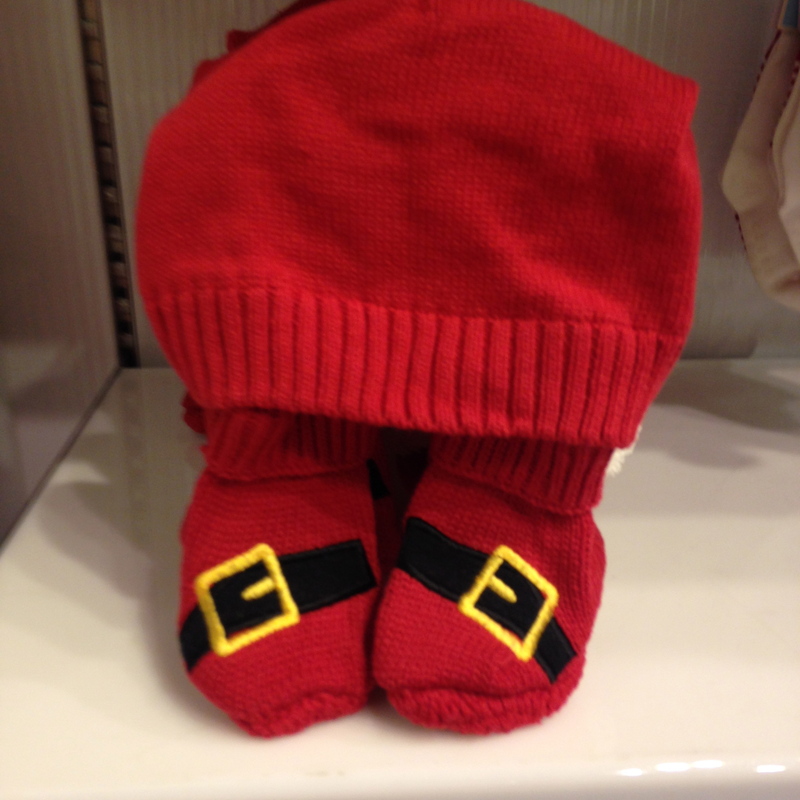 The Children’s Place also has a wide selection of children’s and baby shoes, as well as fun kids accessories to complete the look. When school rolls around in August and September, the stores have a range of kids uniforms to make sure they’re dressed for success in the classroom at reasonable prices. Be sure to sign up at My Place Rewards to receive the most for your money with The Children’s Place coupons and free shipping. The Children’s Place is where big fashion meets little prices! This season critter hats are very popular with friendly monster faces for up to 50% off. All the cozy outerwear are on sale too. This is where you purchase “Baby’s 1st Christmas” outfits and holiday pajamas for all the children. To find a Children’s Place near you or shop online, go to www.childrensplace.com. 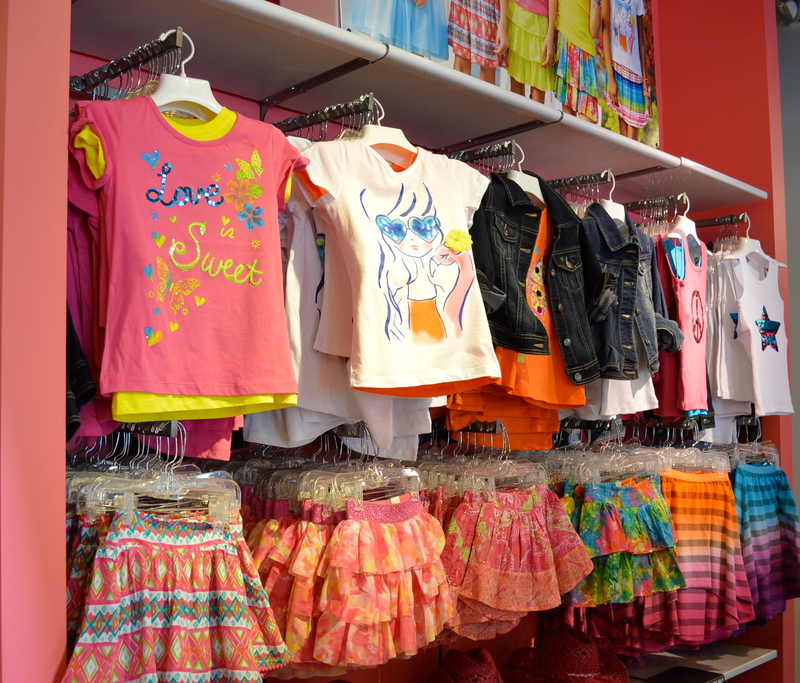 Walking into Children’s Place is like entering a rainbow with bold colors for the Spring and Summer. It seems as if almost everything in the store is on sale. Looking for a special Easter outfit for your daughter or son? 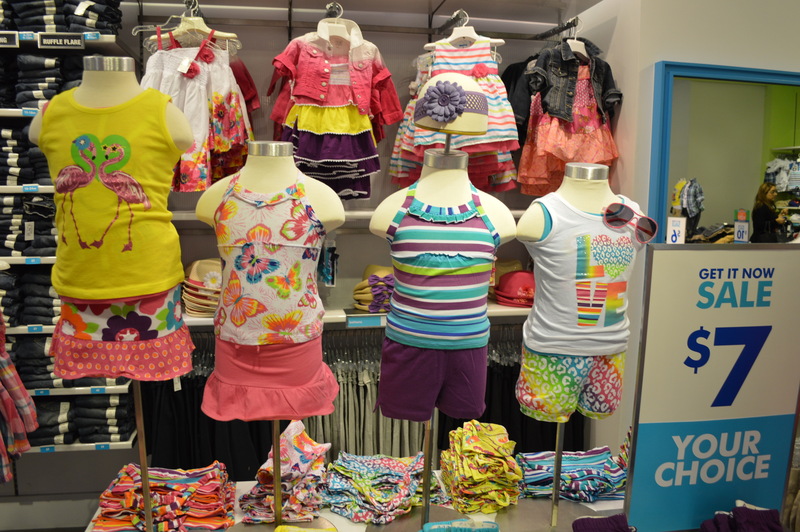 The Designers at Children’s Place used watercolor prints and florals for the girls. Many of the dresses are 30% off. 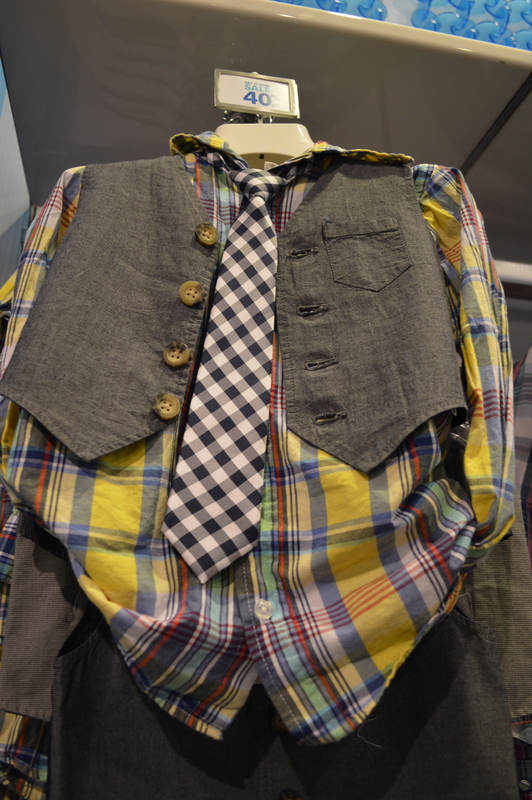 Boy’s will look handsome in argyle shirts with vests and ties to pair casual with dressy. The perfect polo is $7 and up. Searching for a bathing suit for Spring Break and Summer? Girls suits are one and two pieces with pinks, animal prints and stripes. Boys suits this year offer a shark, anchors and skull theme in blue, white and green colors. Boy’s and girls swim and beachwear is 25% off. For school there are jean jackets and jeggings for girls and rugby shirts and graphic t-shirts for boys. Looking for some more great deals? Colorful skirts and sweaters are 50% off. 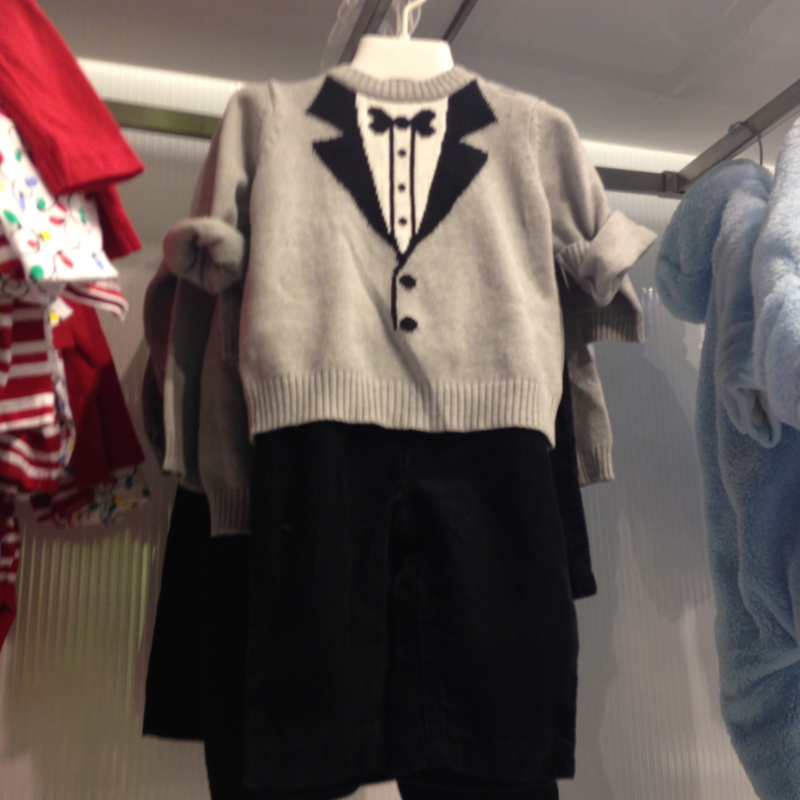 Little one’s 6 month to 4T have a wonderful array of clothing to enhance their “cute as a button” look. On March 29, Children’s Place is having an Easter Party hop over to selected stores to pose in photos with children. There will be sweet treats and even more special deals. The fun starts at noon to 4 p.m. Go to http://www.childrensplace.com/webapp/wcs/stores/servlet/en/usstore/content/2014-easter-bunny?icid=east_hp_btl_031114_mn8 to find out if a store near you will offer this special day. Located on 14 acres of tropical landscape on Mission Bay, The Bahia offers a relaxing destination to unwind and a variety of fun activities that appeal to all ages. There are a variety of rooms for guests from lush garden views with streams to bay front one story to multi-story hotel rooms. I stayed in a single story bay front room #130. The amenities included one king bed with a rollaway for our family of three. Other rooms offer a queen bed or two double beds. I enjoyed the complimentary high-speed wireless Internet , HBO, AM/FM radio, coffeemaker, ironing board and iron, hairdryer, refrigerator and signature bath supplies. The bed was very comfortable and there were lots of pillow. 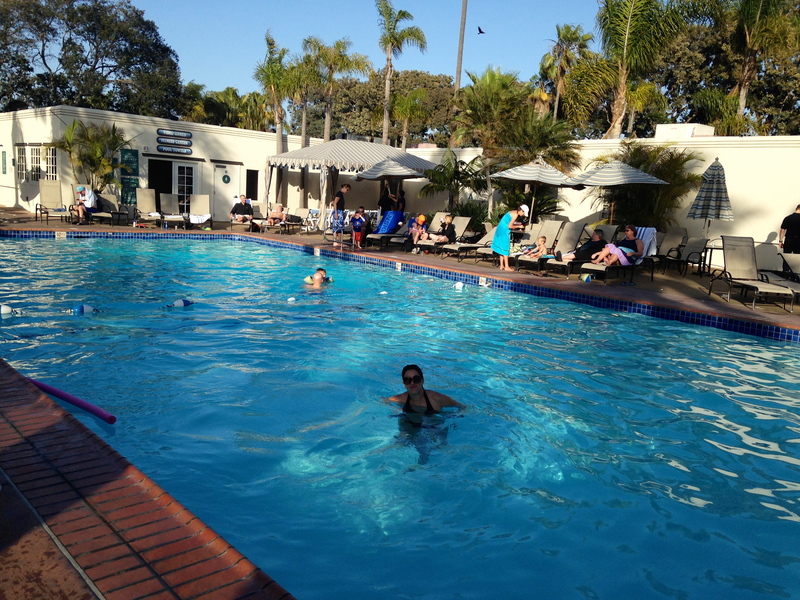 The sparkling blue pool has plenty of lounge chairs to soak up the San Diego sun. There is also a hot tub that easily sits 20 guests. Nearby is a gym and video arcade. 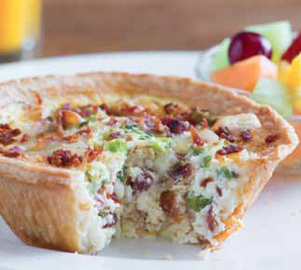 The onsite Cafe Bahia offers a sunrise breakfast buffet until 11:30 a.m., then lunch and dinner. Sit on the outdoor patio near a trickling fountain. 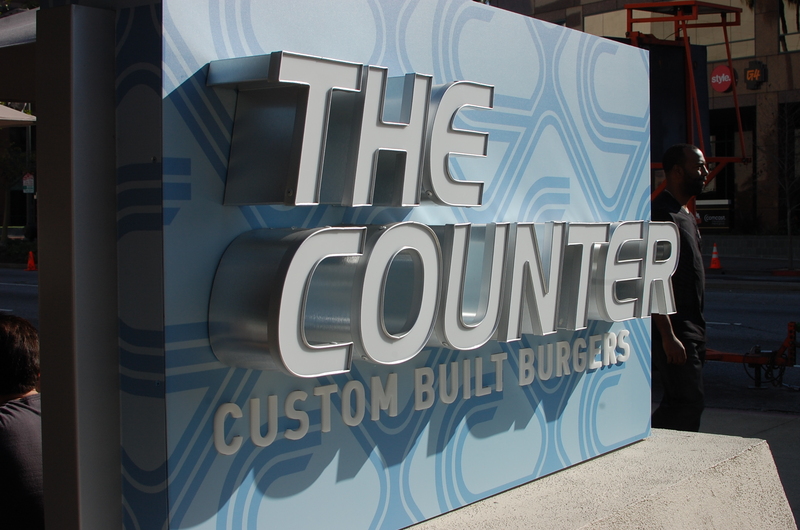 On Friday night they serve a BBQ buffet and on Saturday they serve a prix fixe dinner. At the Moroccan-style Tangier Bar they serve a Happy Hour special from 3 to 6 p.m. with appetizer and drink specials. On Friday night there is a live band and Saturday night the bar has karaoke. 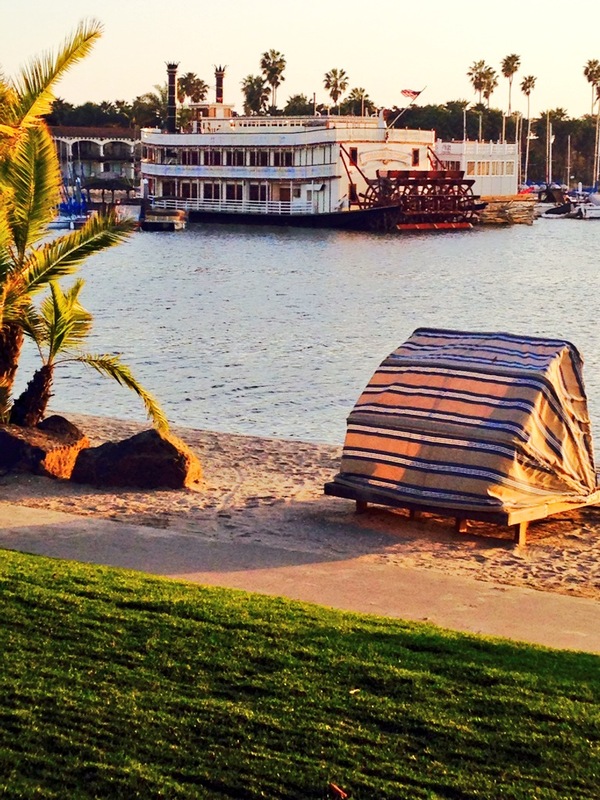 The turn-of-the-century Bahia Belle sails around Mission Bay to the Catamaran Hotel throughout the evening. The Mississippi-style sternwheeler starts sailing at 6:30 p.m. for families. At 9:30 p.m. the Belle lights up with a cocktail cruise. All cruises are offered Wednesday through Sunday and are free for hotel guests. Non-guests pay $6 at the dock. The Strand offers over two miles of paved walking and bicycling paths along the sand, Mission Bay and Pacific Ocean. Along the path are hotels, homes, restaurants and shops. 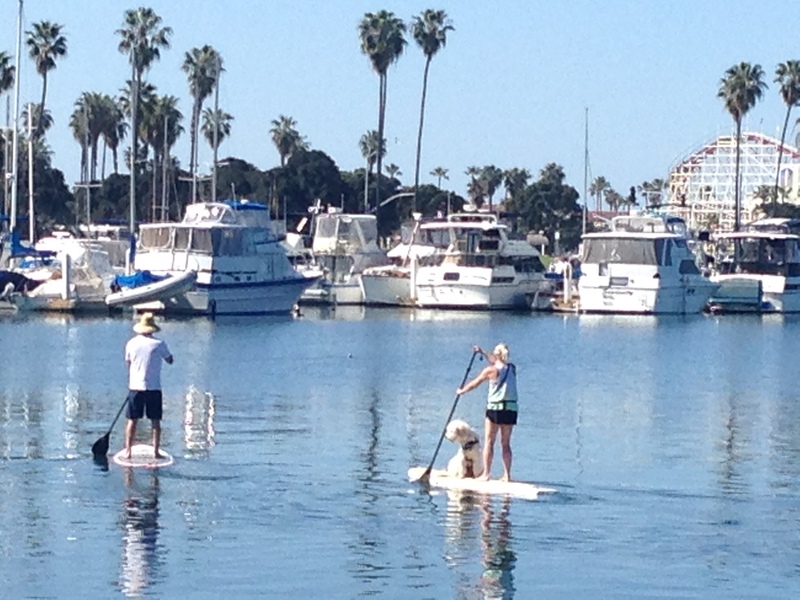 Next to The Bahia is a rental stand to rent bicycles, kayaks, paddle boats and paddle boards to explore the bay. Within two blocks is the Giant Dipper roller coaster at Belmont Park and 25 other rides, shops and restaurants. Free lessons are included with rentals. Near the Bahia Cafe is a home for Gracie the California Harbor seal. She is a resident at the Bahia Hotel Resort. 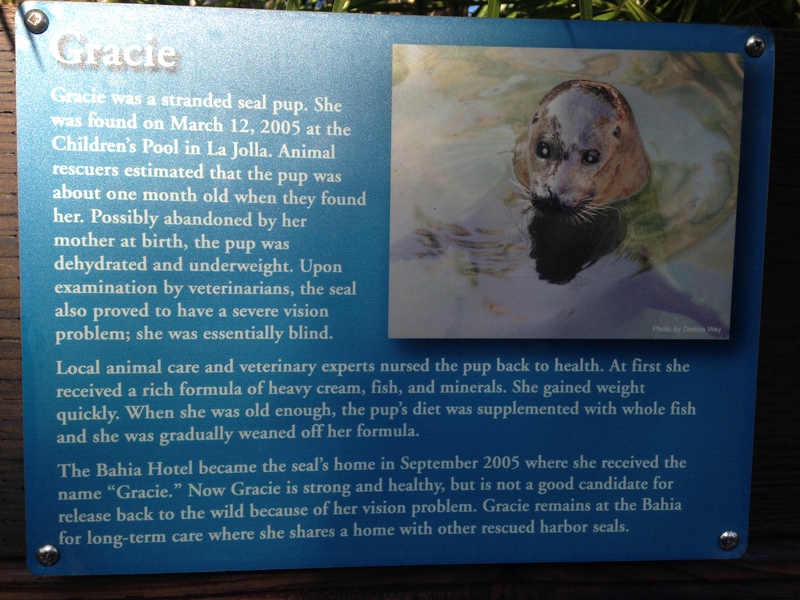 Gracie was rescued as a pup when she was found sick on the beach. Since she is almost blind, she was nursed back to health, but couldn’t be released back into the wild. 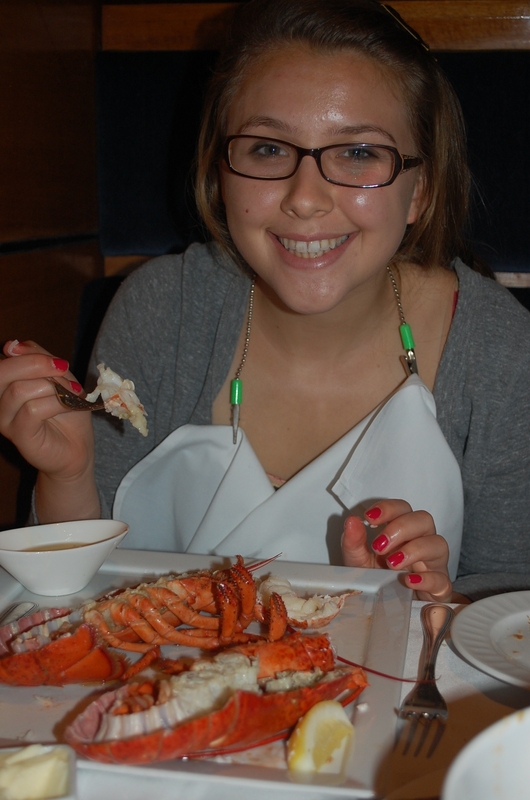 Guests enjoy calling out her name as they visit her swimming in her water-dwelling. Bahia Resort Hotel – 998 W Mission Bay Dr, San Diego, CA 92109 (858) 488-0551 – www.bahiahotel.com. My eight-year-old daughter was excited to experience the new Aulani Disney Resort, however she nervous about our planned snorkeling trip. “What if a shark or puffer fish come up to me?” she cried. I reassured her that Disney would not have sharks or puffer fish in the bay. Little did I know until touring the resort, is that Disney built a Rainbow Reef filled with hundreds of tropical fish, including manybar goatfish and colorful butterfly fish that swim in a controlled environment. The reef houses 40 different species of fish that are found only in Hawaii. For $15 for kids and $30 for adults, guests receive an all-day pass to snorkel throughout the day. Guests float on the surface of the resort’s 165,000-gallon saltwater playground. As fish swim in schools, families can seek out underwater statues and animals. “It’s great for people who’ve never snorkeled before,” said assistant curator Marjorie Awai in an interview. Our daughter enjoyed a day of snorkeling without waves or a strong currant. The calm environment was perfect for her and other children. The fish are tame and used to people swimming around them. Guests who don’t want to enter the chilly water, can view the fish from two viewing windows. Feeding times are at 10:15 a.m. and 1:30 p.m. 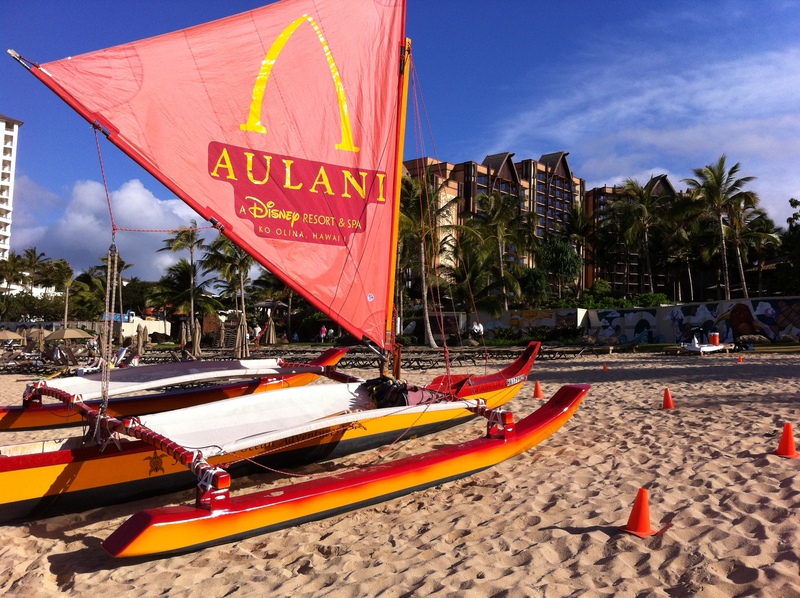 The Aulani Disney Resort is a fantasy playground for kids and adults. 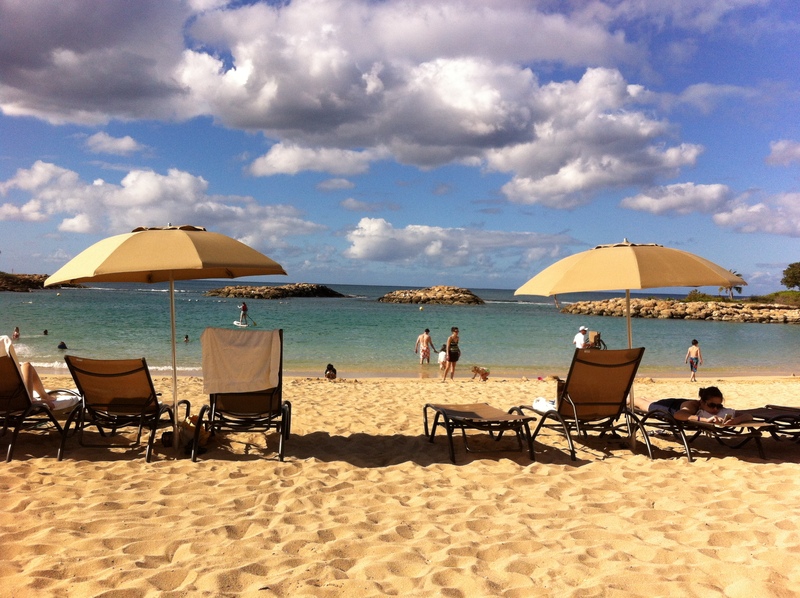 Located on the Leeward Coast of Oahu in the Ko’ Olina community. 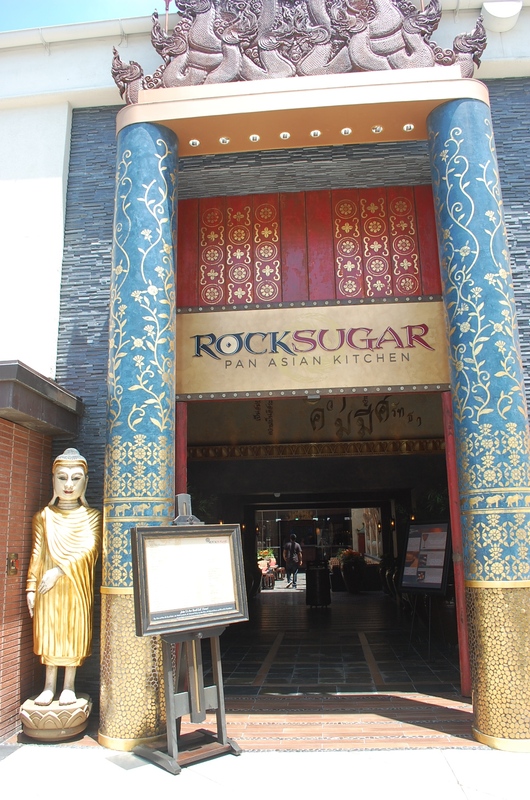 It just opened to guests in late August 2011, just 17 miles, but worlds away from bustling Honolulu and Waikiki. This family-friendly resort features water play areas and two pools; spas for ‘tweens, teens and adults; Auntie’s Beach House kids’ club; Disney character experiences throughout the day and two restaurants. 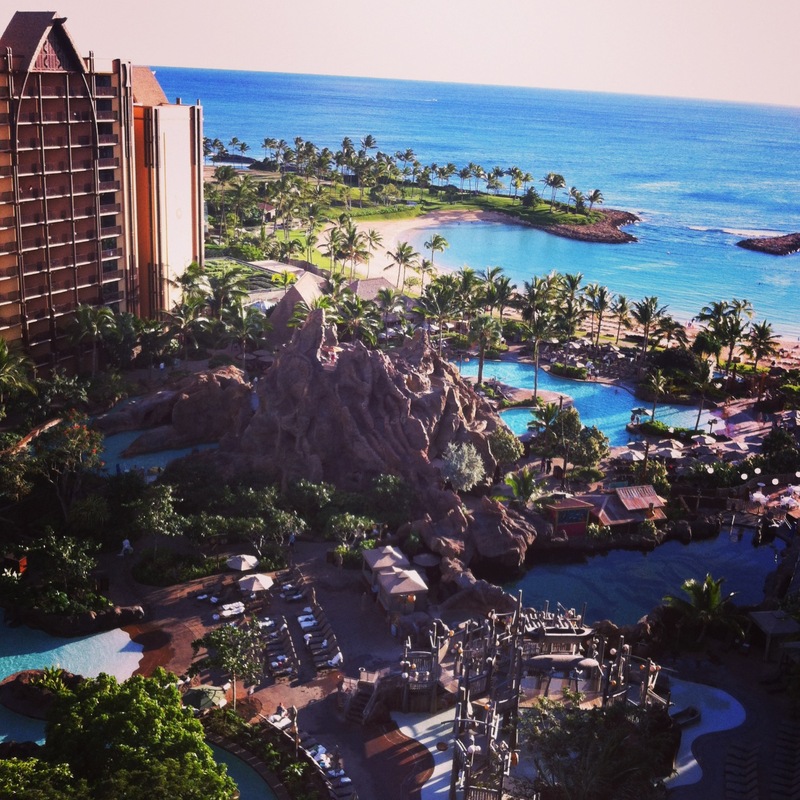 In the center of the resort is a seven-acre water play area called Waikolohe Valley. It’s filled with Hawaiian flora and fauna and a lava-formed mountain that erupts throughout the day. Walking into the third floor grand Maka’ala lobby of the resort, one notices wood carving sculptures and a 360-degree mural of Hawaii. Its history begins before the arrival of Captain Cook to modern Hawaii. Artist Martin Charlot painted a 200-foot wrap around depicting the heritage of Hawaii, the people, land and wildlife. Two streams in the lobby meet in a waterfall going down into a Koi pond. After checking in, we walked to our room and passed the Waikolohe lazy river. Guests were floating by on tan colored inner tubes. “I want to do that,” said our Katie. We did twice a day and had a great time. Guests can take the tubes down one thrilling slide. There is another fun tunnel slide that spills out into the river. Another terrific family activity is the interactive hand-held electronic touch-screen device. It’s like a mini iPad with “Auntie” as a tour guide. She guides families around the resort in search of the legendary menehune, Hawaiian “little people.” With a push of a button, guests learn about local folklore with plenty of fun to excite everyone in the family. A local production company, Searider, helped create this self-guiding tour. There are four outside tours and one inside the magical lobby. 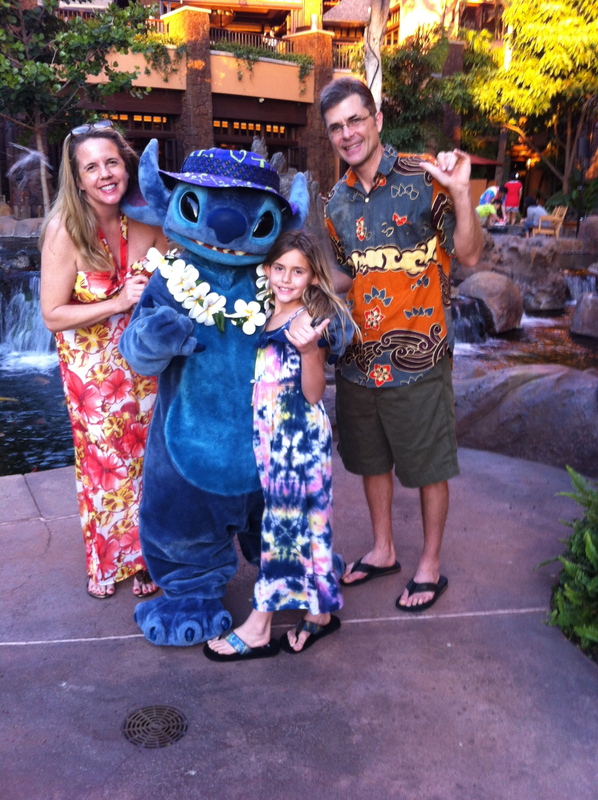 While walking around the resort, guests learn about Hawaiian artwork, history and architecture. Push a button at a designated spot and learn about the Hawaiian sea turtle. With a command, a sea turtle will rise out of the water. Kids can build a sailing canoe with the push of a button and activate a volcano. Our room on the 23 floor had a king size bed and pullout sofa bed. The room was spacious and had a small balcony to sit outside and take in the views. For dining options there is a buffet-style dining with daily character breakfasts below the lobby in the Makahiki Buffet. For lunch we liked to pick up a sandwich, sushi or salad at the Little Opihi’s beach shack and dine on chairs in the sand. For dinner we dined one night at The Olelo Room during Happy Hour. Between 5 p.m. and 7 p.m. small plates and cocktails are from $5 to $7. Another night, we walked outside of the property and across the street to the Monkeypod Restaurant. 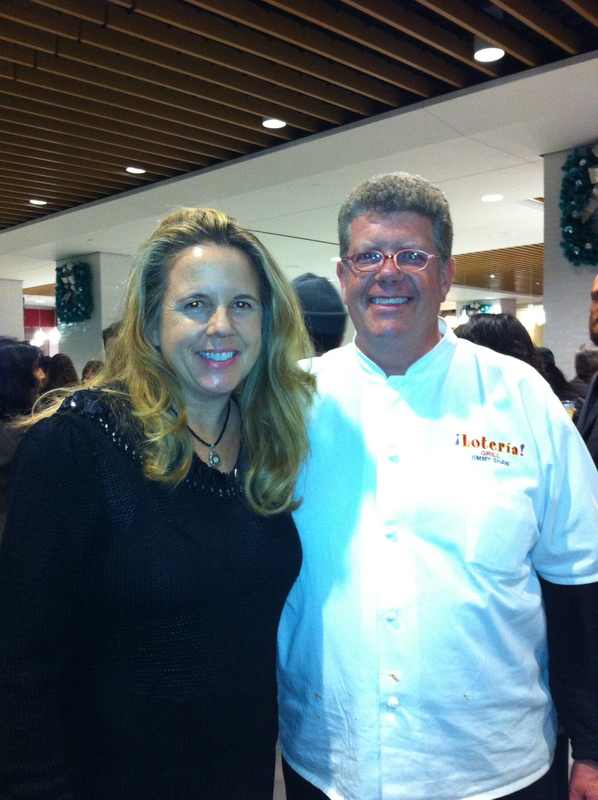 The food is island cuisine and they offer live entertainment. Entertainment is constant at the resort. Children enjoy Auntie’s Beach House from 10 a.m. to 9 p.m. Some of the activities that children may participate in are Stitch Space Goo making, learning how to hula and Volcanic Science. Parents are only allowed inside Auntie’s House during the 8 a.m. to 10 a.m. Open House times. 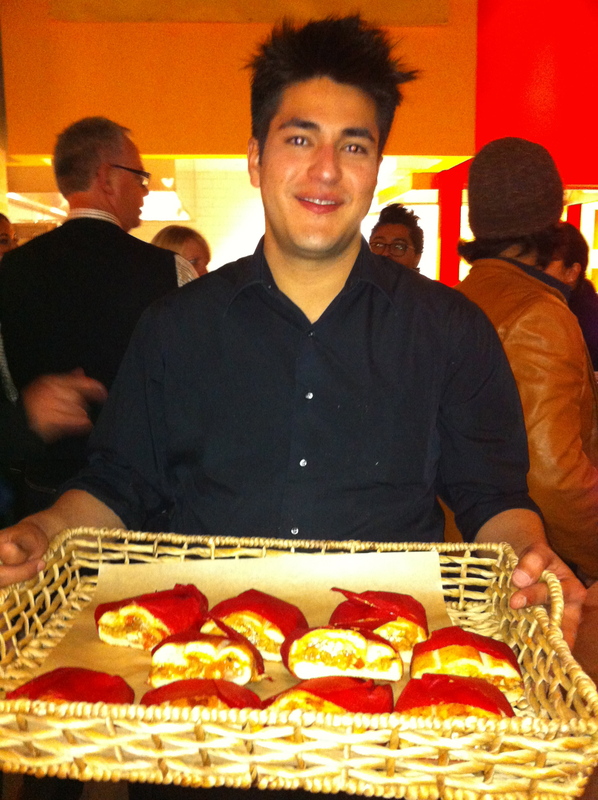 Some of the activities and meals served are at an extra charge, however many of the activities are free. If you get a chance to watch the Aulani Starlit Hui on the Halawai Lawn, don’t miss it. It’s a free family event where guests receive a mat to sit on and watch live Hawaiian music from local artists and dance with some of Disney’s favorite characters. Another interesting family activity is the Mo’Olelo fire pit storytelling. A warm fire overlooking the beach is turned on as “Uncle” shares age old stories and traditions that exist in Hawaii. These stories are passed down from one generation to another. On the beach, guests can go on a sailing canoe ride, check out sand toys, snorkel in the bay or sit under an umbrella with a good book. There is a paved walkway in Ko’ Olina that is pretty for a morning or sunset stroll. JW Marriott has a few different properties in this area. The path takes visitors all the way to the Ko’ Olina harbor. We stopped one morning at Longboards at the Marriott Beach Club for a beachfront breakfast buffet. Walk around the JW Marriott to a beach where sea turtles and Monk seals like to call home. Be sure to wear hard sole shoes on this walk, due to sharp rocks near the water. HELP! I have two people joining us tonight for our Christmas Day celebration, but I don’t have a gift for them? What do I do? Merry Christmas! No worries Stressed Out Mom you don’t even need to leave your house. Just go online to one of the following restaurants and order a gift card now. When you purchase a gift card, they will reward YOU. It’s a win-win situation and stress-free! Holiday shopping just got a lot easier with the Wood Ranch BBQ & Grill holiday gift card sale. For every $50 in gift cards purchased, the buyer receives a $10 complimentary card that can be used in the first quarter of 2014. Restrictions apply: The complimentary card can be used only Monday-Thursday from January 2-March 31, 2014; Only one per person per day can be used; Not valid on holidays. Purchase gift cards in store or online at www.woodranch.com. With more than 200 made-from-scratch menu items, a gift card from The Cheesecake Factory can be a tasteful gift for family, friends, co-workers and clients. Gift-givers can share the gift of cheesecake with everyone on their shopping list and receive a ‘Slice of Joy’ card valid for a complimentary slice of cheesecake with every $25 gift card purchased from Nov. 29 – Dec. 31. Gift cards are available for purchase at all restaurant locations and an ‘eGift Card’ can be purchased and sent online at www.TheCheesecakeFactory.com. The “Slice of Joy” cards are redeemable on a future visit from Jan. 1 – Mar. 30, 2014.
o Guests who purchase $100 worth of gift cards will receive a $20 bonus card for use at King’s Fish House or any other King’s Seafood Company restaurant. 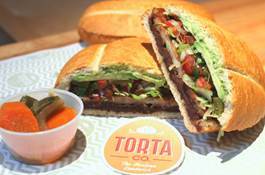 Gift cards from the Corner make the tastiest stocking stuffers, thank-you cards and last-minute gifts. Stop by your neighborhood Corner Bakery Cafe today, and with every $25 in gift cards purchased, you’ll receive a $5 Bonus Card to use when you come in January 1-31.